I took a little break to make a batch of tortilla soup, it’s raining so I want to to advantage of soup weather while I can! My husband is off playing poker so it’s just you and me. 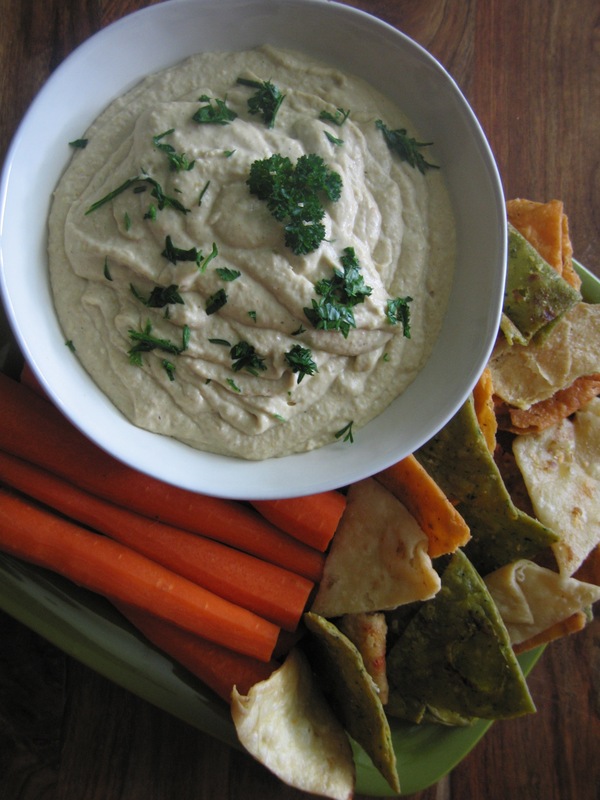 This hummus recipe came from my mother in law and we make it all the time, I’m actually snacking on it right now. I have served this with some colorful veggies for Friday cocktail night with friends or I make it for Billy to snack on with carrots and jicama after work before I get home, if not he’ll eat everything in the cabinets. NOT GOOD ! Or I’ll pack it up for our weekly lunches. It’s creamy, a little spicy and super easy. ENJOY. 1. Drain chickpeas, reserving 1/4 – 1/2 c. of the liquid. 2. Combine chickpeas, zest and lemon juice, tahini, onion, garlic, cumin, salt, and cayenne pepper in a food processor. Turn on and start to puree. 3. Stream in the reserved chickpea liquid and olive oil. Make sure to scrape down side and puree all together.